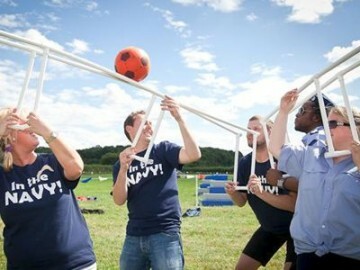 An ingenious team building event to represent the power of one team, one goal. Vastly improve concentration levels on the main topics of your conference; helping to reinforce your message. 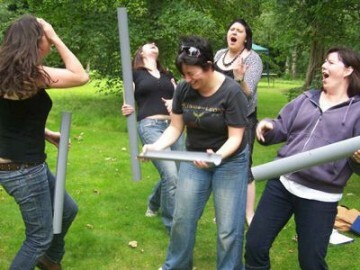 It’s about everyone sharing in thought-provoking, hilarious, fast and furious action in a series of fun, friendly, inter-team competition at a wide range of different and exciting half hour team building sessions that everyone will enjoy. An ingenious, head to head and fun team v team challenge requiring teams to find random clues dotted around the activity site, place them in order and solve the cryptic puzzle which will lead to the correct route to their final destination. Planning, team work and good communication are key factors in this fast-moving “warm up” game. Frantic, fast and great team fun; as they attempt to be the first to arrive at the final destination. end of the course to the other. Luck, team work and a bit of good, old-fashioned gamesmanship are key factors in this fast moving game with the ultimate, of course, being fun. The rules are simple: all of the team must have contact with the equipment, the ball must never come to a halt; or, fall off and – they must win a “best of” series of testing tasks. Sounds simple? Don’t be fooled, as one never ceases to be amazed at how “cunning plans” can suddenly appear to be utterly unworkable! sombreros … behind are buckets full of balls, ahead are empty buckets. Teams have to transfer the balls, tipping from sombrero to sombrero, until the bucket at one end is empty and the one at the other end is, hopefully, full. Seems straightforward enough … of course it isn’t!?! 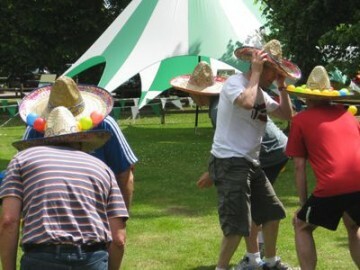 Because, apart from the initial loading of the balls, no hands are allowed … Imagine the whole room wearing sombreros and competing in this event! The teams have to create their own “Team Hat” from a collection of materials, clips, “jewels” and glue … often with surprising results! Expect to be amazed at sheer ingenuity, design and impracticality of some of the creations which will be produced! 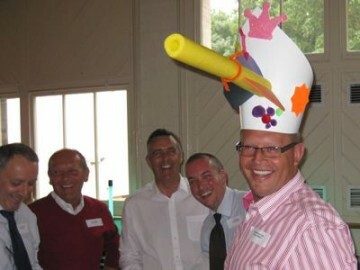 This can be an excellent starter “energiser” and the hats can be used for the remainder of the event as either a table decoration or, as a Team Hat for compulsory wear during the other activities and, of course, at the “Races”! Imagine for a minute the power of a Mexican Wave and the way that it livens up an audience. Instead of simply throwing your arms in the air, now imagine that the whole audience is holding a lightweight railway track in the air above their heads and transporting cargo along it. The group is then provided with a number of balls that must be manoeuvred around the track, by working together. By coordinating the team’s movements by lowering and raising the track the ‘wave’ creates the energy required to move the balls. Build a team plane from the ground up which must be the largest or most complex design imaginable … but, crucially, which must also be capable of flight! However; in building their flight of fantasy, the teams need be aware of the competitions at the end, as the greatest distance flown will scoop the honours. A brilliant energiser, with the fantastic finale and amazing (hopefully!) spectacle of every teams’ plane in the air at the same time!